Anxiety is kicked off by a thought – and our brains have @60,000 thoughts a day – so there is a lot going on up there. The trick is to figure out which thoughts are the thoughts that lead to the anxiety response. A way to think about your anxiety is that it is a red flag that tells you that something needs to be done or something is important to pay attention to. One way that helps to understand anxiety is that we have two brains: our rational brain that problem solves and the anxious brain. The key is to understand what triggers kick us out of our rational brain and into the anxious brain. Triggers are the thoughts that take you to the limbic area, where we experience the fight or flight response. 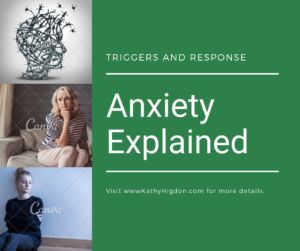 The trigger is the red flag and the key to understanding your anxiety is to figure out what are the triggers that get the anxiety response rolling. no test preparation study notes, get the homework done. when I’ll get the homework done. Then I need to get a good night’s sleep. Often the triggers occur when we’re relaxed or when we’re about to fall asleep. When the thought kicks us into the limbic area, we experience heart racing and maybe shortness of breath (your body thinks it’s running away from something), your Gastrointestinal system shuts down (the blood and oxygen goes to the legs & arms and the heart & lungs to get away from that lion), and the limbic area in our brain gets activated. That part of our brain is ancient – all animals have it. And it doesn’t think – it is designed to focus on getting away from the lion not problem solving. When we are in that region, it takes 45 minutes for the adrenalin to run through our body and then another 15 minutes for the norepinephrine to kick in so we can calm down to normal. A helpful thing to know is that this was designed for getting us away from the lion, not the kinds of things that upset us today. So the system is designed to help us every few months, when it’s our turn to outrun the lion. It’s not supposed to happen every day. And this adrenalin response is designed to happen at 100%, not the 50% that might kick it off in response to a stressful situation. But the 50% response produces the same, albeit somewhat scaled down, limbic response. So, while we’re in that limbic region, it feels like we’re doing something, but nothing really happens. You can tell you’ve been there because you may have some GI problem (stomach ache, constipation, diarrhea, etc). If it goes on long enough (i.e., years), it can produce more long-term problems (colitis, diverticulitis). You may feel really pooped when you’ve returned to normal because your body thinks it just survived the lion but, of course, nothing happened. Afterwards, your body needs to replenish the energy it thinks it just expended, so it craves carbs. The carbs that are easiest to reach for are simple carbs (i.e., food made with white flour and white sugar, like bread or pretzels, etc). In our past, our ancestors would have reached for what was available and what our bodies really need to replenish energy: complex carbs like fruit, nuts, berries, or vegetables. There are things we do to sabotage ourselves – so our anxious thoughts sort of win. For example, we may have done badly on a test or in a course. We tend to focus on the outcome (“I flunked the course.”) rather than on what we did to sabotage ourselves, such as not doing the homework, not going to class. And then the outcome seems to confirm our anxious thought (“I can’t do well in school.”). The key is to set your life up so you can be successful and the anxious thoughts don’t win. We typically do other things to avoid this ugly pattern, such as distracting ourselves. There are lots of ways to distract ourselves: drinking, eating, sleeping, avoiding what causes us to be anxious, etc. The problem with using distraction, avoidance, and sabotage as solutions is that they may temporarily make you feel better but the problem hasn’t gone away. 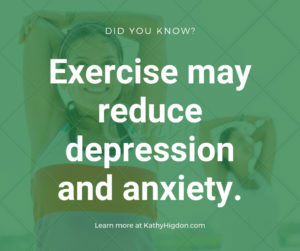 Kathy Higdon is a Licensed Clinical Professional Counselor (LCPC) in the State of Maryland, and a Certified Health Coach from the Institute of Integrative Nutrition, NY. She developed and leads a six week wellness program called Mood Food & Attitude that helps individuals learn how to reduce stress, anxiety, and depression. 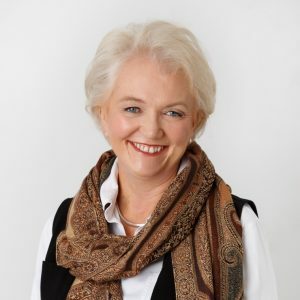 I am a Licensed Clinical Professional Counselor (LCPC) in the State of Maryland, and a Certified Health Coach from the Institute of Integrative Nutrition, NY. 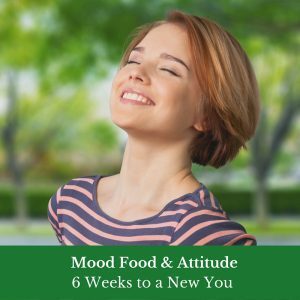 Mood Food & Attitude is a six session group counseling program where I, a licensed clinical counselor, will share data-based information about three lifestyle changes that will help you reduce stress, anxiety, and depression.